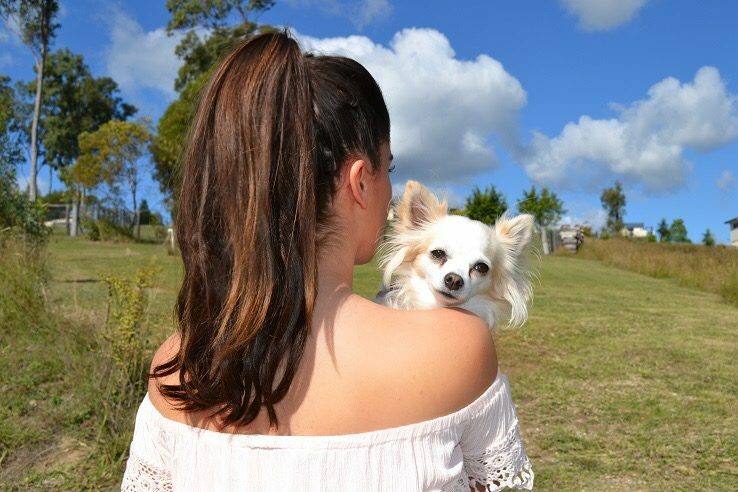 That's according to three models who have shared their stories with K9 Magazine as part of our series supporting Jasmine Dustin's #dogsoverdiamonds campaign. Here's how our interviews with British Model Izunia, Aussie influencer and model Larissa Bartolo and model and make-up artist Kelley Elizabeth unfolded. Hi ladies! Thanks so much for your time today. Please tell us all about your dogs. We feel Emilio's pain! Tell us why you're supporting the campaign. We also run dogsblog.com, the dog adoption site so we agree with all of you. What do you think is the most important thing humans can learn from dogs? Izunia: Hi! Well, I have a 1 1/2 year old white pedigree Pug called Lilly. She is my four-legged pot of joy (laughs) - chicken strip treats are the way to her heart. She might be a little overweight madam but she has long legs to stretch the weight from showing. She loves her teddies and has over 30, I have tried clearing some out but she plays with them all, so it's a struggle. With her little overbite smiling isn't a problem, and usually she'll show me her big eyes to help her get what she wants. She loves chasing her tail, whether she's angry or over-excited she chases it. Larissa: Me next? Ok, my two bundles of joy are Kendra and Kooper the Chihuahuas. And boy are they like Yin and Yang; Kendra my long haired female is a placid sweetheart who loves cuddles and affection, and my short haired boy, Kooper is a playful, hyper active ball of energy! To say they keep me on my toes is an understatement! It's funny to think that these two incredible creatures have brought me so much joy and laughter, they have been the light at the end of many dark tunnels for me and for that I am forever grateful. Kelley: I rescued Beamer, the black Terrier Chihuahua mix about four years ago from a shelter in Miami. By the time I walked through the shelter I was in tears. I wanted to save them all and I couldn't make a decision so I came to the front to make a donation. At the same time, some backyard breeders were dropping off rejected puppies to be put down. Beamer was one of them and instantly I fell in love with him. Izunia: I am a massive supporter of animal campaigns and activist work. I like to stand strong on the topics I am passionate about. Animals have a different journey in their life and have different abilities to humans, yet they should never be devalued to anything materialistic. It's upsetting to know people can buy an animal as a passing thing and leave it like a phone. Dogs and all animals over diamonds any day. One legged or one-eared, I would always pick a dog. They are here to teach us different things that maybe not everyone can understand. Larissa: I am supporting this campaign because animals to me are some of the most important things on this earth. The innocence in a dog's eyes is enough for me to want to stand up and give them a voice. The issues with homeless dogs throughout the world are ever growing and I believe if we all stand up and create awareness on the issue, we can resolve it together and give our furry friends the love, and joy that they give us in return! Kelley: I grew up in a house full of rescued animals! At one point I think we had eight pets, all rescues. I am a huge advocate for animal rights. I believe social media is a perfect outlet to spread the word to get more people to adopt not shop! If I hadn't gone to the shelter the day I found Beamer, he would have been put down. People need to realise how often this happens and how they can help save an animal's life! Izunia: (Thinks about it) Well, this is hard... it would be between silence and loyalty I think. The dog's never-ending loyalty for their owner, without any hesitation to help, comfort, prioritise, engage and never being ungrateful. Man (or men!) has yet to learn of fulfilling such positive qualities to each other without any given benefit. The simplicity of a dog's life is something we can all admire if treated right. I am very grateful to have such a great companion in my life - and even my little monster gets me off my phone a lot. Larissa: The most important thing I believe humans can learn from dogs is forgiveness. No matter what the situation may be, a dog will always greet you with a wagging tail and a heart full of forgiveness. Kelley: I honestly learned so much after rescuing Beamer. He was my first pet on my own, and providing for a tiny little living creature is so rewarding. Rescuing him taught me patience and material things can never make me as happy as he does. When I moved to a new apartment, I bought him his bed before getting my own! I always put him first. Izunia: My dog... teaches me a lot. Larissa: My dogs... are my world! Kelley: My dogs... are my best friends! We will be sharing more news and celebrity interviews as the campaign continues. Head over to the cause4pawsla IG page to see more and share your own photos with them and us @K9Mag on Facebook or @k9magazine on Instagram.